The Norwegian army is driving tanks with the Oculus Rift. Hard at work in virtual reality. Parallel parking is really difficult. If you practice enough, you can get to a good place with it, but even the most expert parkers can cut too early or too late sometimes. But when you’re driving a military tank, the visibility situation is even worse, and a mistake could be more dangerous than hitting a bumper or having to start over. 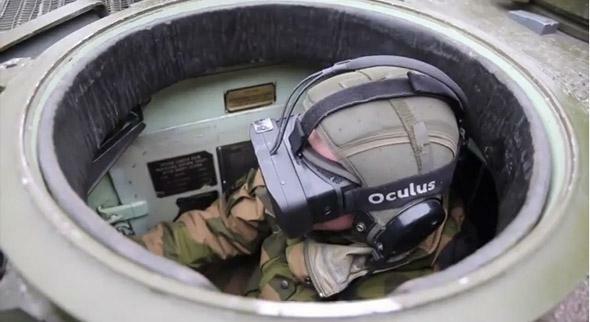 So the Norwegian Armed Forces are using the Oculus Rift to give tank drivers 360-degree virtual reality vision. It’s probably still difficult to park a tank, but at least the VR view lets the driver see everywhere instead of having a partially obscured view and multiple blind spots. Right now the Norwegian army is just testing prototypes, but eventually terrain maps, a dashboard of vehicle diagnostics, or other information could easily be added in the virtual reality field of view for easy access. The Rift technology is not quite mature enough to be used in combat settings at this point—by the way the Norwegian army is currently active in Afghanistan, just a quick recap—but army officials seem to think it will get there within a few years. “This is a very promising concept. We see that the glasses don‘t yet have the necessary screen resolution to see well at a distance, and they may cause some dizziness for the driver. But this, we believe, will be improved quickly,“ Major Ola Petter Odden told Norwegian news channel TuTV. But in the future VR technology would especially be useful in combat scenarios during which drivers need to keep tank hatches closed. Now if only the Rift could make street parking easier.